When you enable Http or Stream in Yawcam your computer starts to act like a server. To be able to serve your viewers with images from your webcam your computer needs to be reachable on the Internet. A typical home router (with NAT) will by default stop requests from the Internet and not pass them through to your computer. In other words requests to watch your webcam will be stopped by the router. This is why we need to open a port in the router so that requests for your webcam will reach Yawcam. This is called "port forwarding". 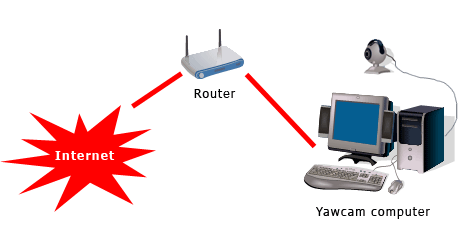 Enable UPNP in your router and let Yawcam forward the ports automatically. This option is the easiest and recommended, but only works if your router supports UPNP. Read the more detailed instructions on this instruction page. Forward the ports manually by changing the settings in your router. You need to forward port 8888 for TCP traffic and port 8081 for TCP and UDP traffic. Please visit www.portforward.com for more information on how to forward a port. Click on the name of your router and follow the guide.